It’s an awkward fact of life on social that you are ever only one post away from trashing years of careful brand-building. With United, Pepsi, Donald Trump and many others in the news recently for getting it badly wrong, we’ve been looking at moments where it all went bad. Worryingly, we found the same mistakes being made repeatedly. With the following examples typifying many of the most common mistakes, why do they keep happening and how can you avoid the same fate? When headlines like “Another reason to hate Crocs” appear because of your social posts, it’s time for a strategic review. 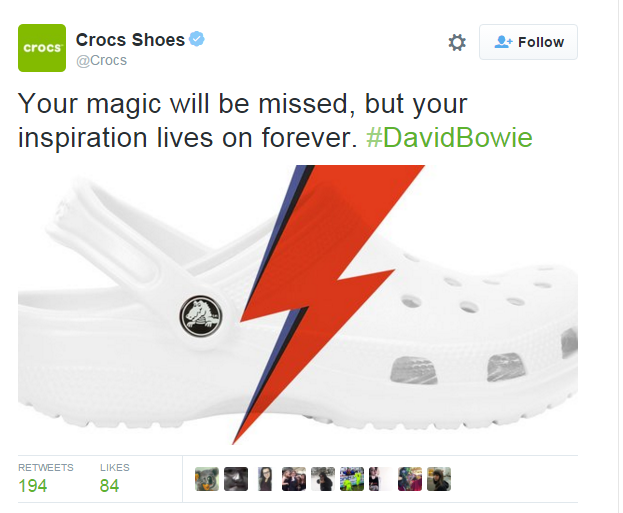 David Bowie’s death was one such moment for footwear brand Crocs. It’s not uncommon for brands to react to such news but Croc’s response was very ill-judged. A creative genius commemorated with a hurried cut and paste graphic? Fans greeted the image with justifiable disdain. The sentiment for this tribute was overwhelmingly positive. Why the difference? After all, both are basically just an annotated product shot. Well, Chevrolet, as makers of the “Little Red Corvette”, have a genuine connection to Prince and whilst simple, the tribute is classily executed. The brand had a reason to join the conversation and did so in a dignified way. Quick, reactive, content can be a winner. Just be sure it is on brand, on message and written for the needs of your audience. 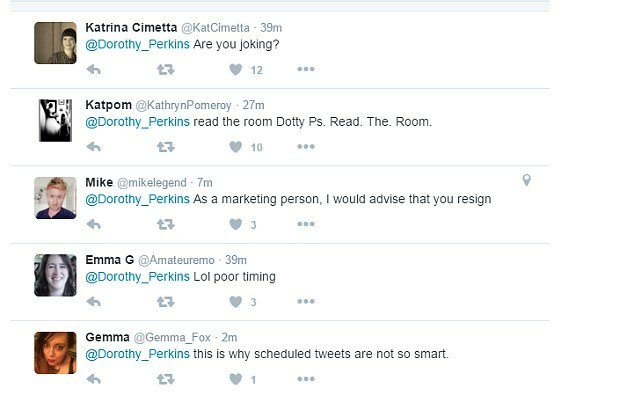 Due to an unfortunate scheduling faux pas, Dorothy Perkins posted a rather exuberant #FridayFeeling tweet on the day of the Brexit referendum result. There’s a certain piquancy about Dorothy Perkins posting the blandest sentiment in history, yet still managing to alienate 48% of the country. Said 48% were not shy about expressing their unhappiness. Making matters worse, national coverage in the Mail Online and Metro.co.uk mocked Dorothy Perkin’s insensitivity. DP deleted the post soon after and apologised. So what happened here? This looks like thoughtless content, created and posted to a schedule by someone who wasn’t thinking about the brand at all. And that thoughtlessness backfired spectacularly. In most cases, you just end up boring people instead of attracting national headlines. But isn’t that almost as bad? 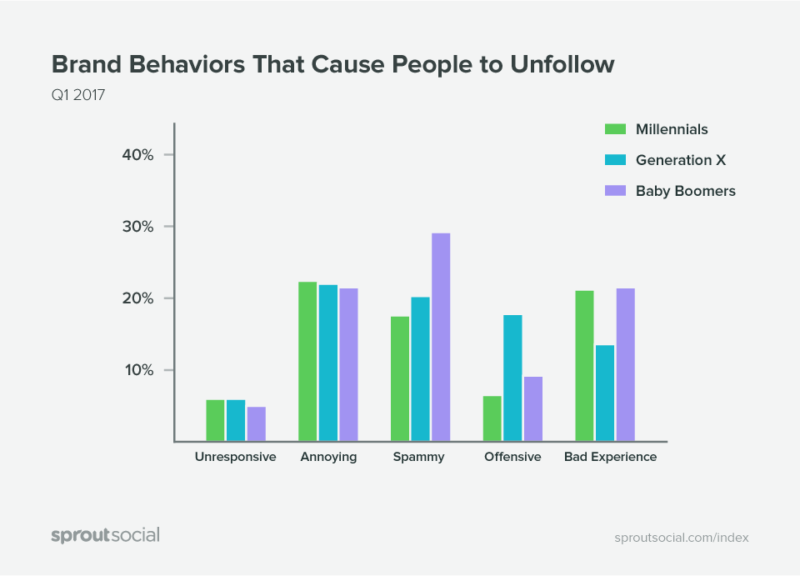 ‘Spammy’ and ‘annoying’ posts are the top two reasons people unfollow your brand. You wage a constant battle for consumers’ attention: wasting the opportunities you do have is painful to watch. User generated content is the holy grail of social media marketing success: people and fans who love you so much they create brand content for you. Coke are skilled at this strategy, witness their named bottles promotion: perfect for sharing on social. JP Morgan Chase’s ideas were less inspired. Never adored, bankers were particularly unpopular during the last recession. 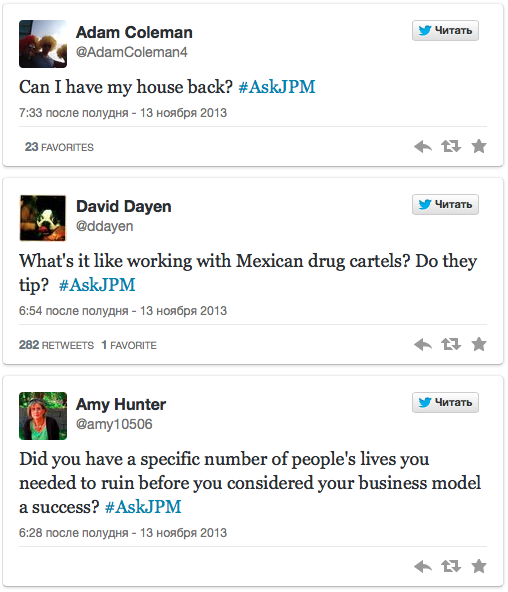 So, what possessed it to hold an ‘#askJPM’ session in 2009 is a mystery: what possible benefit could this social media marketing activity deliver to its brand? Even the most cursory social listening programme would have told them this was a bad idea. As soon as the session was announced, the savaging began. The session was cancelled shortly after. For brands that find themselves under attack on social, one key to survival is to have a army of fans who will defend you. When Greenpeace launched a campaign against Dove about palm oil, the brand’s many fans defended it stoutly. Its brand values of empowering women, combined with some deft PR footwork (rapidly committing to ending all use of Palm Oil by parent company Unilever) enabled the company to get its counter-narrative accepted. That’s why you never hear about the Dove social fail. So, how to avoid social media gaffes? Short of avoiding social media marketing altogether, you will always run the risk of getting it wrong. Yes, sensible process minimises risk, but a different issue is common to all these gaffes. A social team that understands the value of considered, thought-through messaging would not have made these mistakes. Produce relevant on-brand content: Get content created by people who understand how your brand is expressed in social. People who make content that is in equal parts brand-aligned and interesting. Don’t underestimate the power of a generic post to bore people away from your brand. Create reactive content: rapid responses to trending stories can raise awareness whilst giving your brand a personality: it’s a winning formula and a key part of your social media marketing mix. That said, only do this if you have people in place who understand your proposition from top to bottom if you don’t want to look like a croc of Crocs. Integrate your social, content and brand teams: If your brand team and content team never talk, you won’t get maximum value from either. Campaigns, social and content must feed off and complement each other to deliver a consistently powerful brand message. This last point is the most important. It’s not just the gaffes you can see that will hurt you, inconsistent brand experience across channels confuses consumers and tarnishes your reputation. Done well, each channel amplifies the message of the others: enhancing your brand and improving ROI. Done badly, you are risking the fate every marketing manager dreads: arriving at work one morning to find a hurricane of hate directed straight at the brand you’ve spent years nurturing.